How to fold and unfold my Mutsy Evo? Unfolding the frame: push the frame lock inwards and push the upper part of the frame up until you hear a click. Press the buttons on both sides of the push bar and twist the push bar up. The push bar is adjustable in 4 height settings. Release the buttons when the push bar is in the desired position. 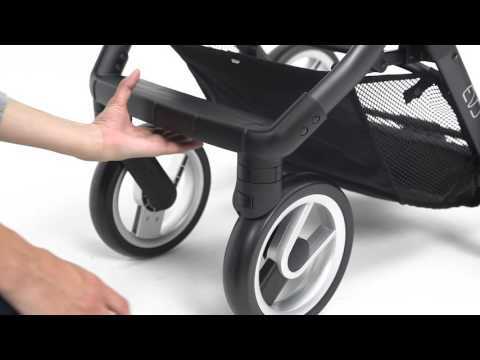 With every use of the stroller: check whether the stroller is correctly unfolded and safely locked. Folding the frame: stand behind the frame and put the brake on. Press the height adjustment buttons on both sides of the frame and twist the push bar downwards until it’s at its lowest position. This position is marked in the pivot point. Pull the unlocking buttons on the inside towards you and then push the upper part of the frame downwards. The frame will lock automatically. 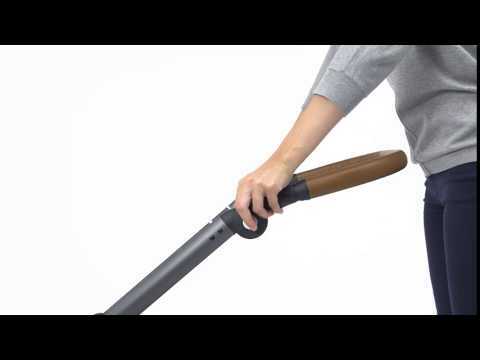 If you lock the swivel wheels before folding, the frame will be even more compact. Adjusting the seat: pull the button at the back of the seat up while you reposition the back rest into the desired position. Adjusting the leg rest: pull the leg rest up or press the buttons when pushing it down while putting the foot rest in the desired position. Adjusting the foot rest: open the zipper around the leg rest of the seat to provide a higher leg rest. The child can rest its feet on the aluminium bar of the rest. Close the zipper for increased comfort for larger children; they can then place their feet on the plastic foot rest. The Evo basket at the base of the frame can carry a weight of 11 Lbs. How do I replace the seat covers? Two press studs on either side of the hood. These are located on the fabric on the inside of the hood. You can then carefully pull the two fabric parts from the Velcro. Two press studs on either side of the hood. These are located on the outside of the hood. You can now carefully pull the two fabric parts from the Velcro. Two press studs on the back of the backrest. You can then carefully pull the fabric at the back from the Velcro. Open the zipper on the inside of the hood. The hood is now free from the bracket. You can now remove the hood upholstery completely. Remove the seat from the frame. Open the zipper of the leg support. Two press studs on the bottom of the seating area at the hinge of the leg support. These are two press studs on top of each other. Loosen both of these from both the fabric as well as the seat. Two press studs on either side of the seating area. These are located on the inside of the seating area, at the height of the bumper bar. Six press studs on the back of the backrest. Make sure the hood is in the extended position so that all openings are free. At the bottom of the seating area, there are 2 clamp caps attached to 2 elastic bands. Push the clamp caps horizontally through the gaps out of the cylinders attached to the seat. Then loosen the waist belts. These are attached to the bottom of the seating area and to the bottom openings of the backrest. Tilt the buckles so that they fit through the openings and pull them along with the belts through the gap of the seat and the upholstery. The shoulder belts are attached to the rear of the backrest. Tilt the buckles so that they fit through the openings and pull them along with the belts through the gap of the seat and the upholstery. You can now remove the seat upholstery completely. Remove the seat from the frame. Position the upholstery in the seat. At the bottom of the upholstery, there are 2 clamp caps attached to 2 elastic bands. Guide both of these through the opening between the seat and the backrest. Now fix the clamp caps to the cylinders. These are located under the seating area. Push the clamp cap horizontally with the notch to the cylinder so that it locks into place. Now attach the waist belts. Push the buckles along with the belts through the required openings of the fabric and the seat. These openings are located at the bottom of the seating area and at the rear of the backrest. Make sure that the buckles cannot slip out of the openings by tilting them so they lie flat on the plastic. Now attach the shoulder belts. Push the buckles along with the belts through the required openings of the fabric and the seat. These openings are located at the rear of the backrest. Make sure that the buckles cannot slip out of the openings by tilting them so they lie flat on the plastic. Two press studs on the bottom of the upholstery. These are located on a narrow fabric part at the bottom of the seating area. These need to be attached to the upholstery of the leg support. These can now be attached as a combination to the press studs on the bottom of the seating area. Two press studs on either side of the backrest. These are located on the outside of the backrest at the hood bracket. Make sure these two press studs are guided through the openings on the inside to the attachment points. This is only possible if the hood is in the extended position. Four press studs on the outside of the back rest. These press studs can be attached along the outside. Close the zipper of the leg support. The upholstery of the seat is now fully attached. Remove the seat from the frame. Place the hood on the seat's hood bracket. Guide the bracket into the slot of the zipper and enclose it by closing the zipper. Two press studs on the back of the backrest. Two press studs on the right on the inside of the hood. Open the hood and fold the two fabric parts inside. Attach the two press studs of the fabric parts to the inside of the hood. Then attach the Velcro to the fabric of the seat. Two press studs on the right on the inside of the hood. Once attached, you can turn the fabric part inside and attach to the Velcro. Repeat the last two steps for the press studs on the left side. The upholstery of the hood is now fully attached. To adjust the length of the shoulder straps, loosen the shoulder protectors from the belt by undoing the snap buttons. This will reveal the belt buckles. Adjust the length by sliding the buckles along both shoulder straps until your child is comfortably secure. After adjusting, press down both snap buttons to relock the shoulder protectors in place. The back support contains three positions for the shoulder belts. To adjust the position you remove both shoulder belts by moving the attachment rings through the openings in the back of the seat. Move the attachment rings through the desired openings so that the shoulder belts are positioned properly. If the waist or crotch strap needs to be reassembled move the attachment ring through the corresponding opening. Removable fabric parts (only consisting of fabric) can be washed in the washing machine on a wool cycle at 30°C. Wash without bleaching agent and do not put in the tumble dryer. Do not iron or dry clean. Before washing fasten all zips, velcro and poppers. This includes: Travel cot lining, seat covers, mattress cover, the fabric parts of the 5-point belt, foot muff, safe2go seat cover. You can treat stains on the outer fabric or lining of non-removable parts (or fabric parts that are combined with other materials) using a liquid, bleach-free soap. Always treat the whole area.This includes: the seat cover, the canopy, the carry cot cover itself, the storage compartment, the cover and the safe2go inlay, the pram booth cover, nursery bag and parasol. The mattress can be carefully hand washed with lukewarm water. Do not use soap. Do not machine wash, do not tumble dry, do not iron and do not dry clean. How should I clean the mattress? The mattress cover can be washed on a 30°C wool wash cycle, without bleach, do not tumble dry, do not iron and do not dry clean. Ensure mattress and cover are completely dry before use. Installing the back wheels on the Evo: place the axis of the wheel over the back axis mount. Pull the wheel to check whether it is fastened tightly. Installing the front wheels of the Evo: shift the axis of the front wheels upwards over the axis mount until they click tight. Pull the wheel to check whether it is fastened. Removing the Evo back wheels: push the button in the middle of the wheel and pull the wheel axis out of the tube. Removing the front wheels of the Evo: push the button on the front of the wheels and pull the wheel out of the mount. Why do the foam tyres lose their shape and become flat after some time? Flattening of foam tyres is normal wear and tear; the same as shoe soles for example, which also wear through use. The wear depends on user conditions; temperature, ground, frequency of use, weather conditions, load, etc. The advantages of foam tyres continue to be intact, however: they never leak and are lightweight. How do I assemble and disassemble the Evo basket? The basket is secured to the chassis at two points on both sides. Undo the press studs on the webbing. At the front of the basket there are 2 button clips attached to 2 elastic bands. Push the button clips vertically through the gaps out of the cylinders that are secured to the chassis. At the front of the basket there are 2 button clips attached to 2 elastic bands. Secure the button clips to the cylinders of the chassis: Press the button clip vertically with the gap to the cylinder until it clicks into place. The basket is secured to the chassis at two points on both sides. Make a loop around the chassis tube with the webbing and secure the press studs. Undo the bumper bar in order to create more space. Undo the shoulder belt from the hip belt. Do this by pushing the shoulder belts sideways from the insertion point on the hip belt. Place the footmuff in the seat and open the zip. Insert the shoulder belts through the appropriate opening in the footmuff. Do the same with the hip belts and the central leg piece. On top of the footmuff, there are two press-studs on each side. The attachment points for these press-studs are located on the back of the back support. These can be found by undoing the back of the cover. Secure the footmuff to the back support with the press-studs. Place the bumper bar back on the seat and re-attach the cover to the back support. 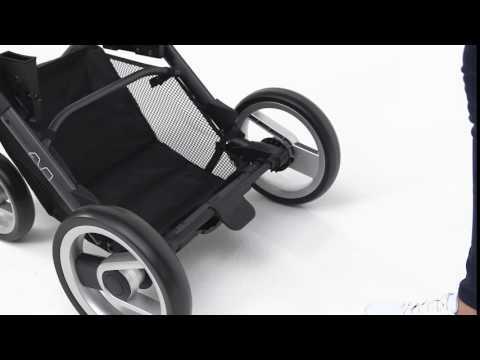 Which car seats are compatible with the Mutsy Evo? Place the adapter marked R on the right side and the one marked L on the left side in the retractable Universal Mounting System (UMS) elements. Push until you hear a click and check whether they are fixed in the holders.